We understand that the pace of digital technology has left many of the old video formats gathering dust, along with many memories trapped on VHS, HI-8 and DV tape. 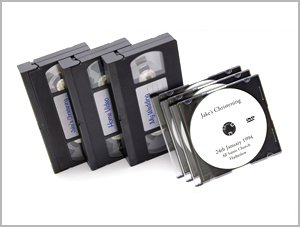 Mint Copy can unlock those memories for you by transferring your old ‘Home Movies’ straight onto DVD. At just £10 a tape this is one of our most popular services. Great care is taken with the tapes you provide and if any won’t play in our machines you won’t be charged.